Today, I bring you a match made in heaven; two peas in a pod or like peanut butter and jelly. When you meet your soulmate, you find that connection and create a bond that can’t be broken (unless you get divorced like me). I’m not talking about marriage. I’m referring to the VGOD PRO150 TC Box Mod and the VGOD TrickTank Pro RDTA, coming together as one and living their happy vaping lives together. Enough sweet talk, this pairing, quite literally was made for each other. 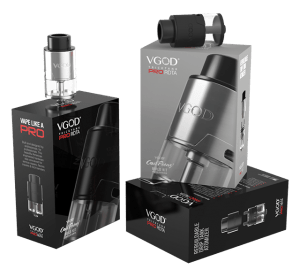 Even though you need to purchase them separately (VGOD PRO150 TC is $104.95 and VGOD TrickTank Pro RDTA is $57.95 at Element Vape), buying both and combining them together creates an epic duo that will amaze anyone that wants to see what premium vaping gear has to offer. I’ll begin this double feature review with the VGOD PRO150 TC Box Mod. Sit back, grab a vape and hope everyone enjoys the read! The VGOD PRO150 TC Box Mod bleeds luxury and finesse like no other device I’ve held. Initially, holding a huge box that the Pro 150 comes in, I was confused as to what else came with it. I was expecting a small box with the device and a USB cable but was introduced properly with a VGOD hard shell case that everything comes housed in. This case is rugged, well-made and a great additive to a premium device, making transporting everything safe and easy! It has a mesh pocket on one side and a cross-hatched elastic section underneath the foam insert to hold your supplies in place. And with the big rubber VGOD logo plastered on the top, the presentation was very impressive and definitely suited the premium experience to the tee. 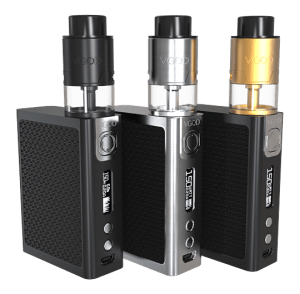 Designed by VGOD USA in Torrance, California and manufactured by Atom Vapes, another highly successful technology company, comes one of the highest quality devices for the price point I’ve seen to date; no sugar coating here this is the real deal! Available in Black or Stainless Steel, the VGOD PRO150 TC Box Mod is crafted out of Aerospace carbon fiber, brushed Stainless Steel and chromed Zinc Alloy components. The carbon fiber door panels have a flawless carbon weave that you have to touch to appreciate. You can feel every individual fiber overlap and feels so awesome in the hand. It’s the real stuff ladies and gentlemen; no carbon fiber stickers on this one. The brushed Stainless Steel is truly high quality and has held up to over a month of daily abuse with no scratches or dings anywhere in sight. Along with beautiful etchings and engravings in several areas, there’s no doubt in my mind that VGOD really came up with a work of art! The VGOD PRO150 TC is powered by the ATOMV.150B chipset designed specifically by Atom Vapes for this device. You have up to 150W of power and a max voltage output of 8V at your immediate disposal. With Wattage Mode, Mechanical Mod, Pro Mode and TC Mode supporting Nickel and Titanium, the chipset offers you several ways to vape until your hearts content. If you didn’t notice, I excluded Stainless Steel because it’s not available with this device. When I first powered the Pro 150 on and started scrolling through the operating menu, not seeing my favorite TC Mode wire option SS316L, it felt like I was punched in the groin. And with no TCR options to compensate as well, I’m left disappointed. The back of the packaging and the very brief instruction manual stated there was SS Mode and a Memory Mode but my device didn’t come with either of those functionalities. But Temperature Controlled vaping is not something everyone understands or enjoys for that matter so to some this isn’t going to a deciding factor. Even without the Stainless Steel option, the VGOD PRO150 TC does crank out a lot of power in all the available modes. The chipset allows a very low resistance firing capability with 0.08Ω in Wattage and Pro Mode, 0.07Ω in TC Mode and 0.05Ω in Mechanical Mode (I did verify each and the numbers are accurate). Simple 5-clicks turn the device on and five more powers it off. To switch between operating modes, 3-clicks rotates you through each one. The scrolling is very fast since the increments are in 1W with no half decimals. My time was evenly distributed between Wattage and Pro Mode. Pro Mode is basically a custom ramp-up option that lets you adjust the power curve at each interval to match you style of vaping. The entire mode works great and if done correctly really helps with low-ohm exotic-type builds that need a lot of initial preheat to get going. Side Note: When you’re on the Pro Mode screen, click the (+) and (-) buttons at the same time and it will shift you to the first bar setting. After adjusting your wattage, click the fire button which will jump to the next slot. Once you’re finished, click the (+) and (-) buttons again and your good to go. There are no directions anywhere showing how to navigate or properly setup Pro Mode so I had to share that with you, the loyal readers. 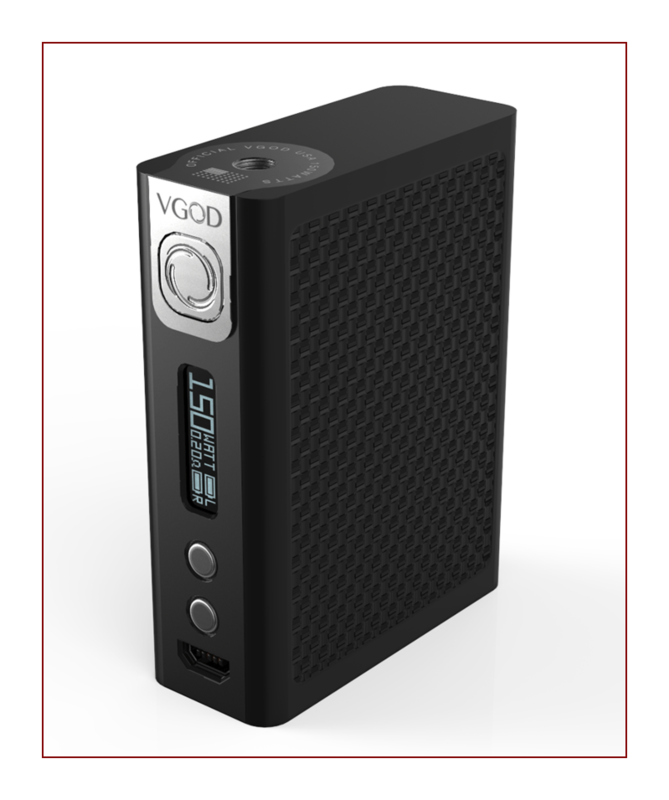 The VGOD PRO150 TC Box Mod is powered by dual high-drain 18650 batteries (not included). Atom Vapes recommends batteries of at least 35-40A and 2600-3000mAh. If anyone knows the chemistry of a battery or who the battery guru Mooch is, the highest amperage possible from any 18650 battery is 30A. I used a pair of married Sony VTC6 batteries (20A & 3000mAh) bought specifically with this device in mind and have gotten fantastic battery life along with plenty of power consistently pushing in the triple digit wattage range. To access the battery bay, there’s a small cutout on the bottom of one of the doors which takes a fingernail to pop the door off. It will take some effort since the two big and two smaller magnets hold the door on extremely snug. There’s very little side to side play but nothing you’ll notice on a daily basis. Each battery slot is labeled (L) for left and (R) for right since the display screen shows you two battery icons indicating which one is which. The battery orientation is clearly marked (+) and (-) in a series configuration with Reverse Battery Protection in case of user error. With twelve small battery vent holes underneath the mod releasing any heat away, I never had the device get overly warm. A couple weird things that happen are after installing one battery, there’s a slight buzzing sound. But once you install a second battery, that sound fades but the devices clicks like a clock. You won’t hear it when it’s in your hand but if you put it up to your ear you’ll hear exactly what I’m talking about. Hopefully it’s not a detonation timer like the exploding notes from Inspector Gadget! VGOD has proven they have what it takes to create a solid performing tank. 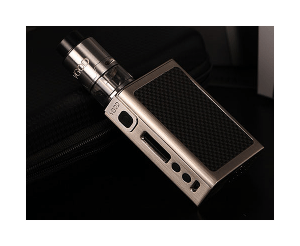 The VGOD TrickTank (see our review here) is a Sub-Ohm Tank that I still use in my everyday rotation because of its superior construction and ease of use. The VGOD TrickTank Pro RDTA is a 24mm Genesis-style Rebuildable Dripping Tank Atomizer (which sits flush with no overhang on the Pro 150W), American engineered and crafted out of high-grade Stainless Steel. The colors come in matching Black or Stainless Steel with the addition of the Limited Edition Gold variation that’s my personal favorite. The same packaging and hard shell VGOD case comes included as well. In addition to the case a CoilFeenz Build Kit which includes a pair of stunning Fused Clapton coils and 20 strips of cotton that comes nicely presented next to the RDTA. The VGOD TrickTank Pro RDTA is the perfect companion to the already immaculate VGOD PRO150 TC Box Mod and complements each other. Upon opening the hard shell case, I was unfortunately greeted to a tinted replacement glass broken in several different places. I’m positive it didn’t happen during shipping since the case feels almost bomb proof so I was off to a bad start. The first thing that stood out to me was the build quality and the way the top cap connects to the build deck like a puzzle piece. The design is very visually appealing but also functions great. The two O-rings surrounding the build deck really holds the top cap down tight but easy enough to pull off without too much effort. You’ll have some eJuice seep out of the fill-hole here and there so a quick wipe down around the airflow is needed once pulling and installing the top cap. The deep VGOD engraving on the top cap while attached to the VGOD PRO150 TC Mod, really makes a strong statement and shows what VGOD and Atom Vapes is truly capable of. The two-post Velocity-style deck gives the user 20mm of total building space with each post featuring dual 2mm post holes and flathead grub screws. The self-wicking pressure system VGOD implemented works really well and ensures fast and efficient wicking. Even with a 4ml eJuice capacity, I was constantly filling the tank since I was pushing close to 120W day in and day out. Pulling the top cap off reveals the 3mm fill hole with a rubber gasket installed (comes with a replacement if needed) that’s located in a bad spot. The way VGOD designed underneath the build deck with two big channels that house the wicks, there’s times my cotton gets in the way of the fill hole. With the pressure system, there are two tiny holes on the build deck that will force juice out of if something is blocking the fill hole. Several times I had eJuice flow over one side leaving a mess. The dual 10mm x 3mm bottom airflow slots are non-adjustable (like the VGOD TrickTank) but worked even better than I ever imagined. Most RDTA’s have a side airflow option so I’m glad VGOD decided to implement bottom airflow. The air comes in and feeds up through four 3.5mm x 2.6mm holes (two on each side) under each coil giving the build deck plenty of airflow. The non-adjustable aspect wasn’t a deal breaker for me as I prefer how swooshy and smooth the airflow is. To be honest, I wish more Atomizers could execute this type of airflow VGOD has done here! This would save vapers a lot of time adjusting and more time vaping! The 17mm Delrin wide-bore drip tip (12.2mm inner diameter) tapers to a large 10.8mm giving you infinite vapor access to your coils. It’s very comfortable to vape on and dissipates heat extremely well. The 510 connection threads are smooth and meet up perfectly with the buttery 510 connection of the Pro 150W; no overhang and no gaps. The Gold-plated Copper 510 pin is not adjustable and is reverse threaded (no righty-tighty lefty-loosey here). To disassemble the tank completely, the 510 pin needs to be removed. By doing just that, the post and peek insulator will also be removed from the build deck. If you don’t have coils installed they will fall out so be careful. Over a month of continued use, the top portion of the 510 pin’s rod is charring black; not sure if it’s a problem yet but I’ll find out sooner or later. With the 510 pin removed, unscrew the glass and bottom section which will finish the disassembly. The O-ring that holds the bottom of the glass fell out a few times and was a pain to get back in since it kept on wanting to twist. Because all the parts and pieces separate from each other, cleaning and maintaining the TrickTank Pro wasn’t an aggravating task. The CoilFeenz Build Kit is housed in a small tin that displays the two Fused Clapton coils and 20 pieces of precut Organic Cotton strips. After attempting to use one of the pieces of cotton, the rest got thrown away. Each one has what I call the ‘throw-away layer’ dead in the center! I tried rolling it and peeling that section out but was left with nothing worth using. It was a good thought but what a waste! The Fused Clapton’s are a whole different story. Twisted in the USA, they are a 6-wrap, dual core 26 gauge NiChrome wrapped in 40 gauge TMN80 (Twisted Messes NiChrome 80) which read right around 0.17Ω (Don’t use in TC Mode). Installing the pair of CoilFeenz premium coils definitely gave me quite the challenge. The Fused Clapton coils were quite small compared to the distance between the two posts. Post hole to post hole measured 10.3mm so I had to manipulate the leads to fit properly. I eventually had to rewrap one of the coils after tweaking two of the wraps trying to install them. I know this might sound like a user mistake but believe me it’s not an easy or straightforward task. If you’re going to include a set of beautiful coils for a particular application, especially paying a hefty premium for the additional accessories, at least make the installation process painless and not cause unnecessary work for the consumer. Once I got them fitted correctly and the flathead screws tightened down, these coils performed flawlessly. Huge milky dense clouds with awesome flavor equated to a month long vape experience! I dry-burned and rewicked this pair of coils more times than I can count and got over a month of usage out of them. The Fused Clapton’s didn’t even come out to play until the 100W range but woke up and hit hard at the 110-130W number. Not sure if the NiChrome or the builder is the difference maker here but excellent, pure excellence. 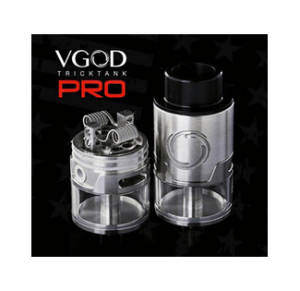 You don’t need excessive cotton to get the VGOD TrickTank Pro to wick correctly. Just place your four cotton ends into each 4mm wicking holes. The length of the included cotton strips is a good reference point on how much cotton I use. Once wicked, I always poke a close-pin or needle through each slot a couple times and I find that prevents any dry hits while experiencing no leaking. 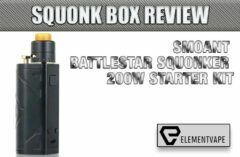 As great as the VGOD TrickTank Pro RDTA and VGOD PRO150 TC Box Mod are, there’s a couple areas that I need to address. With the Pro RDTA’s tinted replacement glass broken, I was left without a spare in case something happened to the original and I prefer the look of the blacked out glass versus the clear. Another thing is the top cap can get blistering hot! Everything under the build deck stays room temperature but with the huge wattages I was throwing at the tank, it got to a point I had to give it a break to cool down. The VGOD PRO150 TC is a fantastic device other than not including Stainless Steel Mode as an option. I don’t understand why it was marketed as an option then not implemented. But hopefully the firmware is upgradeable and that minor defect can be remedied in the near future. And lastly I wish VGOD would’ve included a more detailed manual for both products. A simple trifold piece of paper didn’t do a good job explaining anything and some of the information on it was wrong and misleading. Regardless, these are subjective issues and overall, the two devices together provide an unbelievable vape experience! 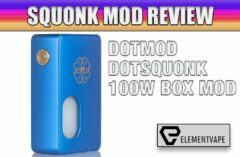 $104.95 At Element Vape – In Stock!